In the weeks leading up to the Paris of the Plains Bartending Competition, much was made of the fact that Chris Conatser of Justus Drugstore placed every time he entered what was formerly known as the Greater Kansas City Bartending Competition. And last night he kept the streak alive, taking first place with his Manhattan (in)Verse. PoPFest Bartending Competition winners lookin’ pretty happy. From left, Berto Santoro (3rd), Matt Seiter (Fan Favorite), Jenn Tosatto (2nd) and Chris Conatser (1st). That bring’s Conatser’s tally to two first-place wins (2008 & 2012), one second (2010) and a third (2009). Not that he was the only one to reaffirm his track record. Second-place winner Jenn Tosatto, bar manager of The Rieger Hotel Grill & Exchange, is a five-time finalist who placed third in 2008. 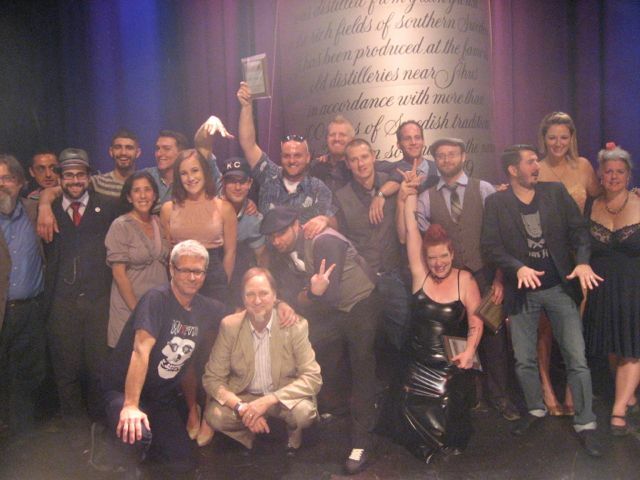 Berto Santoro, Extra Virgin’s bar manager, and Matt Seiter of Sanctuaria, St. Louis were both onstage last year. Santoro took third in 2012; Seiter was voted Fan Favorite. Theirs weren’t the only familiar faces. Kansas City’s Travis Stewart of Port Fonda, Paige Unger of Michael Smith Restaurant and Arturo Vera-Felicie of The Farmhouse were all returning competitors. Other finalists included Chris Burmeister, The Goose and Bramble & Hare, Boulder, Colo.; Carol Donovan, Hearty Restaurant, Chicago, Ill.; Phoebe Esmon, Kennett South 2nd, Philadelphia, Pa.; Giovanni Ferlaino, Ludivine, Oklahoma City, Okla.; and Liz Pearce, The Drawing Room, Chicago, Ill.
Did they put on a good show? Absolutely. It’s no easy thing to batch a single drink for hundreds of people, particularly when your drink includes tricky ingredients like egg whites (Pearce), gilded rose petals (Donovan) or grains of paradise (Tosatto). It might be even harder to make two servings of that same drink onstage, staring into the bright lights and knowing five of the industry’s foremost experts are going to critique each sip. The judges included Doug Frost, one of the world’s preeminent wine and spirits experts and co-founder of PoPFest; Steve Olson of aka Wine Geek, Frost’s partner on Beverage Alcohol Resource and a mezcal savant; David Wondrich, author of Imbibe! and Punch and a BAR founder; Chris Patino, the manager of trade education for PoPFest sponsor Pernod Ricard USA; and Celina Tio, the James Beard Award-winning owner of Julian and all-around cool chef. 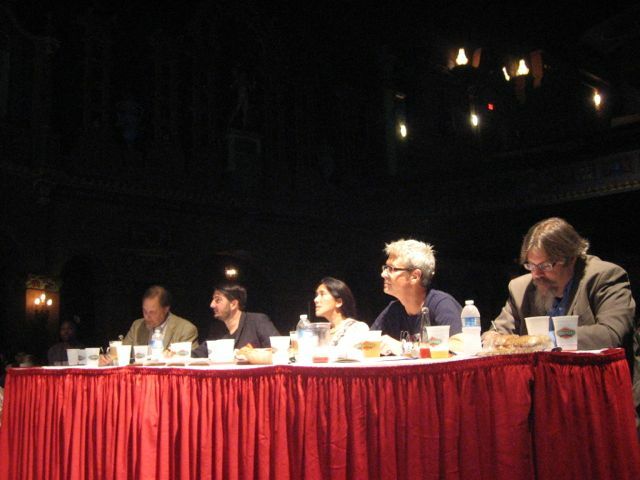 Doug Frost, Chris Patino, Celina Tio, Steve Olson and David Wondrich at the judges’ table. And then they had to make classics like the Aviation, Sidecar, Irish whiskey, Gin Martini, Blood & Sand, Rob Roy, Margarita, Gin Fizz, Negroni and Manhattan while answering questions about Armagnac, rhum agricole, Asian spirits, vermouth, Irish whiskey and mezcal. Oh, and do it all while scantily clad burlesque performers sashayed by or dangled from the trapeze bar. Watching it all, I realized one thing. I’d be happy in any of their bars. Isn’t that what it’s all about? Let’s hear it for PoPFest 2012! So, back to Chris Conatser. He’s a botanist, bartender and science geek. The result is a drink that he explains as an inverted Manhattan, where every ingredient that would ordinarily be made from grain is made from grapes, and grape ingredients are replaced with grain-based ones. Since a Manhattan is typically made with whiskey, Conatser swapped it out for Presidente brandy. The sweet vermouth wasn’t so easy. Since grain-based vermouth doesn’t exist, Conatser made his own using Boulevard beers including the local brewery’s Pale and Amber ales, Bully Porter and Tank 7 saison-style farmhouse ale. That was just the start, though. He added in some Maker’s Mark to raise the proof and then flavored it with both brewing herbs and spices and those used in making vermouth. To sweeten? A barley malt syrup, local honey and spiced-cider reduction syrup. To garnish? A cherry-candied almond. Of course. This isn’t a recipe you’ll make at home. But it’s one you should look over, if for no other reason that it’s pretty damn cool that Conatser managed to do this and make it taste so good. Conatser’s Manhattan (in)Verse: 2 ounces Presidente brandy, 1 ounce beer-based vermouth, 3 dashes Jerry Thomas’ Own Decanter Bitters (modernized with a touch of cedar wood and grape blossom). Stir all ingredients over ice; strain into a chilled coupe glass; drop in cherry-candied almond and cut orange twist over drink with a channel knife. Beer-based vermouth: made from a blend of Boulevard beers, raised to 18% alcohol with Maker’s Mark bourbon; flavored with a blend of classic and historic beer brewing herbs and spices with traditional vermouth herbs and spices (using locally grown and native substitutes where appropriate); sweetened with barley malt syrup, local honey and spiced-cider reduction syrup. Favorite PoPFest moments? 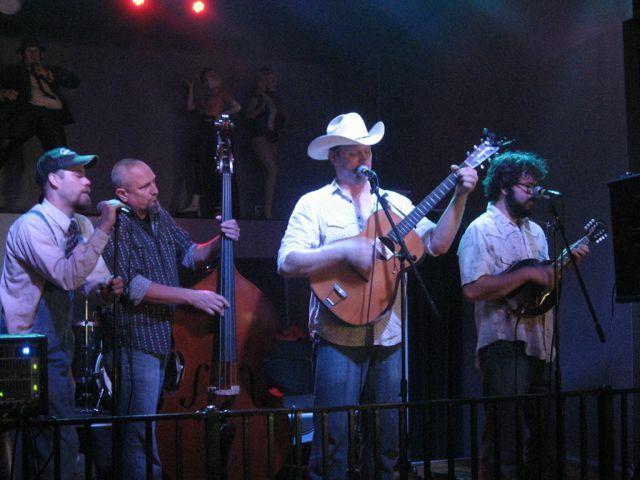 This has got to be one of them—hearing Loaded Goat play its bluegrass-tinged country early in the evening, with front man Eddie Crane on guitar and vocals. ~ by fooddrinklife on August 27, 2012.
) There are some interesting facts mentioned in this article that I was searching for such a long time. Some facts might be not liked by some people but I don’t want to make opinion but personally I liked it much. Good article, thanks and I would like more from you!